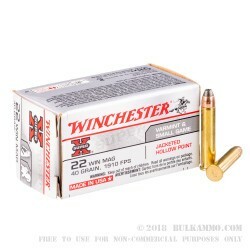 This .22 WMR ammunition from Winchester is a classic varmint load that will make quick work of any squirrels, rabbits, nutria, or other pests on your property. 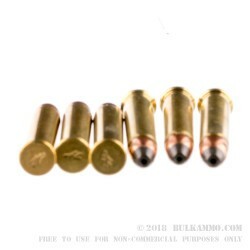 Each cartridge in this 50-round box propels a 40 grain jacketed hollow point bullet at a muzzle velocity of 1,910 feet per second. This high velocity encourages rapid fragmentation for maximum effect against small vermin. 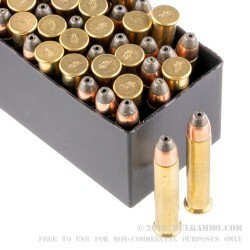 Winchester ammunition is loaded in Oxford, Mississippi. 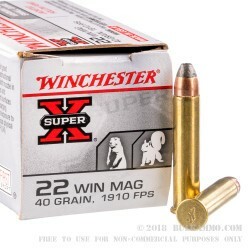 The Super-X series encompasses a wide variety of products, most of which are geared toward hunting, sporting, or defensive use. Wish I had held off when it was $35 a box last week.